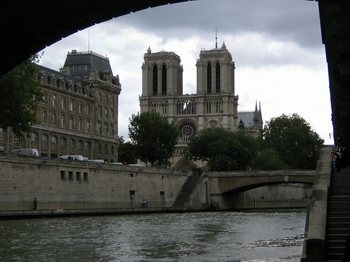 Notre Dame on a rainy day. 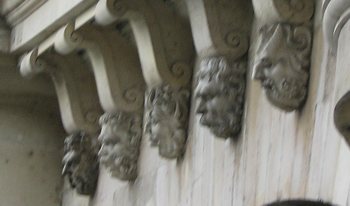 Heads on Pont Neuf on a rainy day. 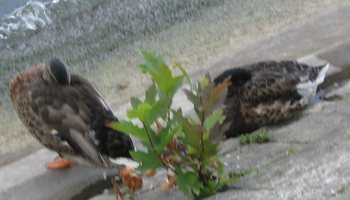 Ducks sleeping by the Seine on a rainy day. 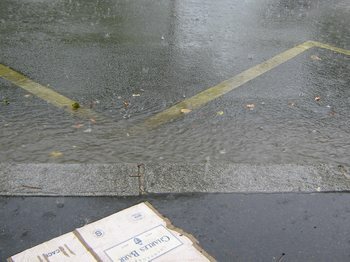 Water running in the gutter on a rainy day, while we took shelter at a bus stop. 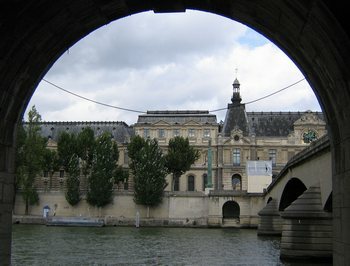 View of the Louvre from beneath an arch at the Pont du Carrousel (photo). We have fond memories of sitting on a bench here, with our cat General Burnside, years ago when we stayed at the Hotel de Lille and the hotel maid was deathly afraid of cats. We were asked to take the cat out while the room was cleaned. They took forever to get to our room, and it started to rain. We took shelter here, under this arch, and waved at passengers on the Bateaux Mouches. The passengers fell in love with the General at first sight. He had a way of charming people instantly, everywhere he went. After leaving this spot, we found a sandwich place that was open (3PM and they still hadn’t cleaned our room! ), so we went in with the General in his carrier. Madame saw him, and brought her own cat down from the apartment above. They could have been brother and sister, those two cats. The General was nice, but Madame’s cat was not too pleased to see him at all. The business of restaurants fascinates me. I like restaurants; obviously, Tom and I frequent them far more than most people do. Our friends at Doc Ford’s on Sanibel know how interested we are in the business because we’ve had so many conversations with them about various aspects of running that fine eatery. And although I love to cook, I’ve never been interested in being in the restaurant business because I know it is so very competitive and not that profitable. My dad, years ago, had clients who owned restaurants, and I remember my dad’s tales about how tough it could be for them. Today’s Le Parisien has a two-page spread about famous brasseries and restaurants in Paris being acquired by groups. This is a trend that has been going on for the past decade, at least, but now it seems to be accelerating due to a number of factors, not the least of which is the fact that many restauranteurs are arriving at retirement age, and there are just not many individual buyers out there. Tom and I remember reading an article or essay a few years ago about the shock and horror felt by the staff and loyal customers of a famous old brasserie, I think it was La Coupole, when the chain called FLO purchased it. Well, it survived, and the ironic thing is that this year, FLO was bought out by two even larger investment groups, CNP (Albert Frères) and Tikehau. The restaurants are still referred to as “le groupe FLO,” and they include a number of fine old brasseries like La Coupole as well as chains such as Hippopotamus (80 restos) and Bistrot Romain (40 restos). I was shocked to see that the beautiful La Fermette Marboeuf was purchased by a chain called les Frères Blanc, I’m not sure when, and that last year this chain was bought by CDC enterprise capital. The oldest restaurant in Paris, Le Procope, is also owned by this group, and so is the chain Chez Clément (12 restos). Also shocking to me is that the restaurant we fondly refer to as “the white sheep place” (L’Auberge du Mouton Blanc) is owned by the Gerard Joulie group. So is Montparnasse 1900. The famous and trendy brasserie Lipp and the elegant, big tea room Angelina are a part of the Bertrand group. So, how much does one of these places cost? According to the reporter Valèrie Hacot, a beautiful brasserie costs the equivalent of its annual sales. If the place is prestigious, it can cost more. A brasserie that funtions very well will have an average of 5 million euros in annual sales. Some “jewels” are much more. L’Alsace (part of les Freres Blanc), for example, has nearly 15 million euros in annual sales. Same for La Coupole. He also points out that the restaurant business is subject to many unpredictable risks, such as the weather and the numbers of tourists. The minimum wage and other costs are going to increase in the future, yet it is not really possible to raise prices without noticeably losing customers. Economizing on the products can also be dangerous, Watkins said. Last night we had another delicious meal with our friend Alan at L’Antre Amis, a restaurant that is still individually owned. The owner & staff are so friendly. I wish them a profitable future. J and M are now safely back in Connecticut, and Alan leaves for California next week – Deb is already there. We’ll miss them all! 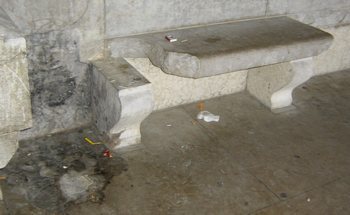 Sadly, the bench where we sat under the Pont du Carrousel with the General is now all broken up by vandals. I do hope that the City of Paris will repair this.